When I was contemplating what to write my next post on I initially decided to make another ordered list, similar to what I did for Final Fantasy, but for The Legend of Zelda. However while I pondered what exactly I liked and disliked about each game, I quickly came upon a bit of a revelation that I think is pretty interesting. There really wouldn't be any way to squeeze my thoughts on the matter into a couple paragraphs in an "ordered list" style post, so I figured I would promote it to a full blown post of it's own. I still plan to attempt to orderfy the Zelda games in the (possibly) near future, but for now I am going to pontificate on the topic of The Legend of Zelda, and magic. More specifically I want to talk about the second game, The Adventure of Link. So if you aren't familiar with the game, let me give you a little backstory, so to speak. As I said, The Adventure of Link was the second Zelda game released, and was released on the NES a mere 11 months following the original. It's most widely known for being the most hated game in the series (except maybe if we were to count the CD-I games, though most people do not). This isn't neccessarily because it is a bad game so much as it is a big departure from the original, and soulcrushingly difficult to boot. 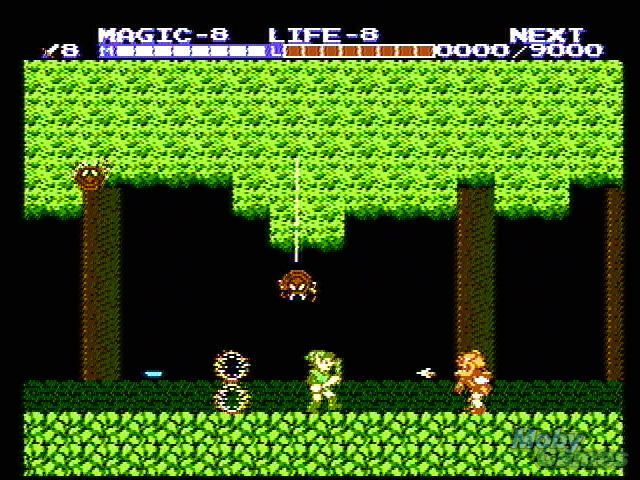 Not in a good way either, Adventure of Link runs the full gambit of cheap and frustrating NES style deaths that make you want to Hulk Smash something. It was definitely not without it's merits though. It features an RPG style leveling system in which the player could earn EXP and invest it in upgrading life, damage and magic. Needless to say, the last of the three is what we are looking at today. What's so big about magic, you may ask? It's certainly not uncommon for a Zelda game to have a magic meter. The presence of magic is certainly not what makes AoL interesting. What makes it interesting is simply how the game approaches magic. Specifically, Link had the ability throughout his journey to learn 8 spells: Jump, Shield, Fairy, Life, Fire, Thunder, Reflect and... Spell. Now if you were to take a moment and think about it, you may well get the feeling that this all seems out of place compared to other games in the series. Sure, Link is no stranger to magic. Has he ever really had magic spells though? Has he ever been the guy who casts magic? Well, aside from AoL, no, not really. Sure he's shot his fair share of Light Arrows, but you don't ever see him waving a magic wand, or whatever voodoo he apparently did back in 1987. Where the distinction lies is that in your typical Zelda game, Link isn't really the origin of any magic so much as the recipient. He finds plenty of tools that conveniently come pre-enchanted with the power to spout giant walls of fire or transform his enemies. 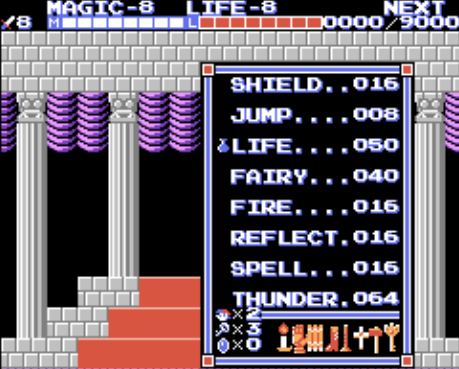 In this case the magic meter isn't really a measure of Link's "mana" or whatever you want to call it. Rather, it's more of an artificial limit on how much you can use a certain subset of tools. In which case, if Link doesn't have any magical power of his own, what exactly does he do to ignite those fire arrows? The mechanics seem to suggest he has some form of magical power, at least on some level, but the narrative seems to suggest otherwise. Which is why when I was thinking about The Adventure of Link, it felt so odd envisioning Link casting all of these magic spells. Now, being as this portrayal of Link as a spell slinger has all but vanished in the past 15 years, it seems like Nintendo wanted to steer away from that. On one level, it makes sense. Link is more of a gritty, actioney hero. His sword is his iconic weapon, and his tools are cool because they are tools. Seeing your boomerang fling across the screen is a bit more personal and direct than a random fireball spouting from your body. A tool is found and stays with you all game long. Magic can have a lot of that draw as well, but I just feel like it really doesn't fit Link's persona. That isn't to say magic doesn't have a place in The Legend of Zelda. I very much think it does after stumbling across this stream of thought. What's most interesting about the spells in AoL isn't so much the fact that they are different from Link's usual fare. What I find most interesting is that they actually change up the gameplay quite a bit. In most Zelda games, a lot of the time your tools can feel like little more than a fancy key. Certain puzzles will require that you have the correct key to proceed, but beyond that they don't maintain much use. Obviously more recent games have fought against that trend pretty hard, but the point still stands. In the case of AoL, some spells are required to traverse specific obstacles, but most if not all have a range of possible uses. Who knows when it could come in handy to jump real high, maybe some players will want to do so more often than others. You never need to use the Fairy spell, but some people still love it. The majority of AoL's spells offer a wider gameplay experience, they feel more like tools than most of the items Link typically finds in those dungeon chests.